3 How does Combin works? Instagram has become a great tool for connecting with friends and family and engaging an audience to view the photos, videos and blogs that you post. People see it as a great platform to showcase their skills and talent and thus create a strong and supportive fan base as a result of effective promotion. If you aspire to be famous by promoting your ideas and objectives, you need to create an effective base of people who act as your permanent followers. Marketers see it as a great opportunity to get an engaging audience that would follow them up and thus would help them in reaching social marketing success. Here’s a solution that can fulfil this objective. Combin App, developed by Instagram users can act as a great help in accelerating your rate of followers on instagram. The app is a tool that would help you in getting a large chunk of instagram followers in order to build up an engaging audience. The best thing is that you do not need to worry about any kind of breach of instagram terms and guidelines or worry about any violation of platform’s limitations. This app has varied features that would strengthen your instagram account or page by adding up more number of followers. It has tools to enlist the followers that match up to your interests and ideas. You can easily search the names out and Combin would quickly enlist the ones that are worthy enough to get into the list of your followers. Using Combin, you can find posts by ‘hashtag’ or ‘location’. Now, what Combin does is that it performs combination searches by hashtag + location. Due to this combination search, you are able to get the most relevant content and potential customers on your account that can be targeted for promoting your ideas. You can also interact with the people who you follow or who follow back you, right from this tool. One of the interesting things is that you can also find the subscribers and commenters of your companions and get them to be listed in your own following user accounts. Combin grants you a tool to know about and manage your followers. Getting attention of potential clients for your account is a task which can be easily achieved by Combin. You can also manage your instagram following and followers in just one tab. So, you can perform tasks for single and mass following and unfollowing of instagram followers. Combin helps you in finding out the followers you don’t follow you back. Thus, it helps in keeping a track of your followers and act as a medium to manage them. Using Combin, you can easily interact with your followers and get their attention towards your offerings. You can discuss ideas and opinions with your followers under the found posts. In addition, you can also like and comment under the post that would be scheduled to instagram’s daily activity limits. You can manage multiple instagram accounts using Combin just with one go. You can also sort your followers’ list by segregating between your potential clients and unwanted followers. Decide it yourself which posts satisfies your arena of interests and follow up those accounts that provides you contentment with what you promote in there. You can choose this action by watching previews of instagram posts and accounts. Thus, Combin provides you with a feature to sort your search results by relevance so that you can get the most followed users and the hottest posts first. This is one of the most popular features of any social media application. Combin has made it interesting too. You can like posts and content of found accounts by selecting one, a few, or all items from search results by clicking at the ‘like’ symbol located at the top left corner of the search results window. You can Comment on posts and accounts from search results by selecting the items and clicking the ‘comment’ symbol. Select items and open the comment form. Click ‘+’ symbol and add new text to each new comment form. The comments will be posted in random order. Click the bookmark symbol to save the comments as templates for future use. You can also add emojis by clicking the smiley symbol and picking up the ones you desire to add in your comment box. Combin prefers two-factor authentication and if it’s turned on in the Instagram settings for your account, you will receive a code to prove that an attempt to login was done by you. After proving the same, you will be logged with your Instagram account within Combin application. Then, you will be able to search and interact with the targeted audience. Combin offers unlimited subscription. Yes! You do not get any trials for using the app; it serves you unlimitedly once you get logged in. 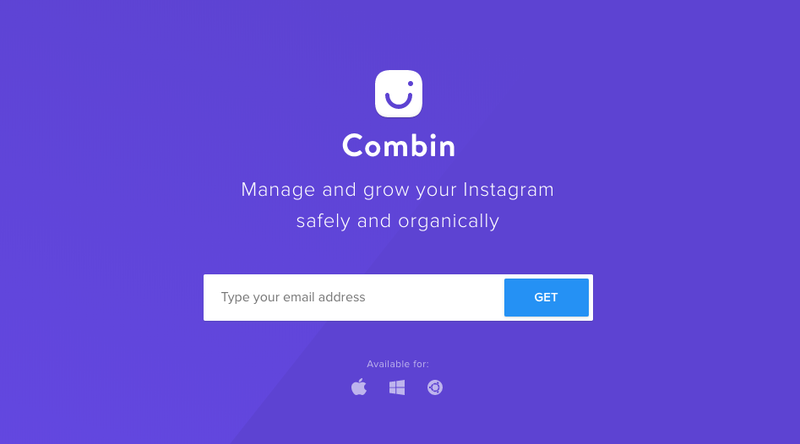 Combin works just with the insertion of your instagram account. It is very concerned for user privacy and thus it doesn’t collect any kind of private that the user might be worried about to get stolen or hacked. It is very easy to use and works efficiently to build up followers that serve the purpose of promoting your ideas. It is available for Mac, Windows and Linux platforms. Download and install the app on your windows, Mac OS and Linux and launch the application in order login by one or multiple Instagram accounts on ‘Welcome page’. Combin supports two-factor authentication and thus there is no need to worry about your passwords. Open the search tab and click on to the ‘Add search’ to get an audience on Instagram. Now, here you can search posts that seem relevant to you using ‘hashtag’ and ‘location’. Type in a hashtag and specify location, date, and number of tagged posts you’d like to receive. After this, Click ‘Find’ to start searching for relevant Instagram posts. Example: If you are a writer and want to attract more viewers to your blog, use creative hashtags like, #penspeaks #write-ups #words #poetries etc. You can click on ‘Users’ in the search parameters window. Here you can set up criteria for finding followers and commenters of particular Instagram accounts. You can find new people and sort your search results as per your convenience. You can sort them by number of followers and filter out your followers, people you already follow, private accounts, and public accounts. Words are very powerful. You can choose the method of interaction to attract more followers to your account. You can choose with whom to have communication with. Perform single and mass following and unfollowing just with a single click. Combin can also instantly detect who doesn’t follow you back and you can unfollow them both selectively and a whole lot in one click using Combin application. After selecting your followers, you can log out by clicking on the ‘logout’ located next to your Instagram username in the main tab window. Search history usually gets deleted soon after you have logged out your account. 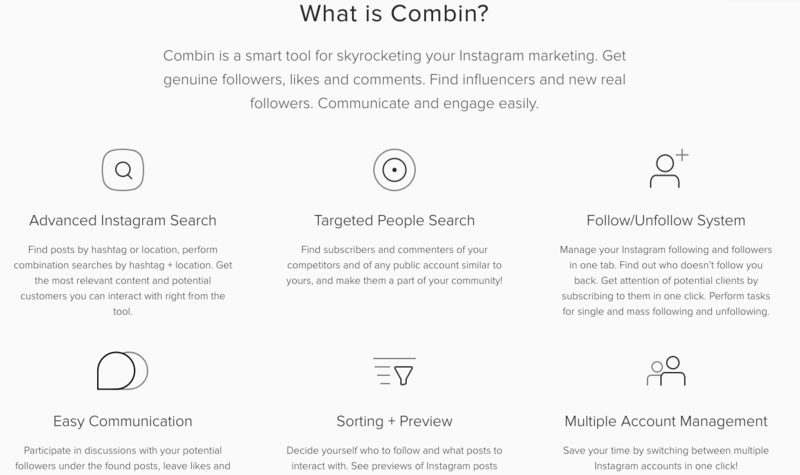 Getting more followers on Instagram with the help of Combin is very simple and economical. As per the basics, Combin basically offers two kinds of plans to choose for its users. Both of these plans are equipped with distinctive features that are mainly focused to get you a wide and wise range of followers that you aspire for. 1]. Personal Plan: This plan is ideal for individuals and brands having one Instagram account. Subscription price: $10 per month. Up to 500 search results for posts. Up to 500 search results for users. 2]. Business Plan: This plan is best for agencies and businesses having multiple Instagram account. Subscription price: $30 per month. Up to 5 Instagram accounts management. 3]. Free Plan: This plan allows you to add one Instagram account. Additionally, you can receive up to 50 search results for your getting followers. You can subscribe on any of these plans as per your requirements. Go for the one that suits your objectives. Thus, it is very evident now that Combin doesn’t believe in getting a chunk of mundane followers with likes and comments. It believes in getting an audience that is really interested in following you up in order to get more of what you offer. So, stop waiting for other tools and download this app in order to create an engaging audience for your instagram account.